Pathfinder Company: 44 Parachute Brigade-‘The Philistines’ Book Review!!! Graham Gilmore has given us a very well packaged history of the short lived but highly trained and effective unit in the SADF. The Unit is Legendary among Southern African Wars due to its unique formation and composition. Some of the very top soldiers to ever live, Col.Breytenbach, CSM Peter McAleese, CSM Dennis Croukamp and others concieved, trained and deployed a unique experimental unit to fulfill the need for a specialized troop to recce and coordinate airborne drops of troops. Their selection process in the Drakensburg mountains was as tough as the SAS, SEAL’s, Delta, etc. One of the most interesting factors of this study is the relationship it had to Rhodesia’s foreign troops from Europe, the UK, Canda, Australia/New Zealand and the US. 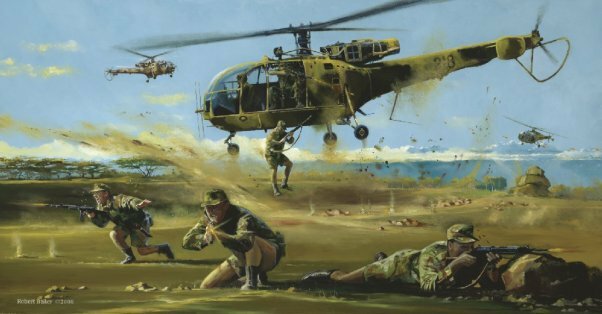 After the Bush War in Rhodesia was lost through the UK and the US installing Mugabe, the men of Rhodesia’s special forces were disbanded and treated as fugitives. South Africa capitalized on the experienced men and leadership by forming the Pathfinders and funneling others to units in the SADF. However, many traditional Afrikanner staff officers were shocked by the operational methods and discipline of Rhodesia’s soldiers. The foreigners greatly disappointed the rigid culture of officers in the SADF. Col. Breytenbach realized the potential for the unit as he did with the Recce’s and other units.He himself was a Leader. Colonels don’t usually demand they be the vanguard of a unit in the bush seeking contact with the Terrs. Yet this is the type of unit the Pathfinders of Phillistines were. Like American units in WW2 or Vietnam such as the Marine Corps Raiders, or the LRRP’s, they appeared, shook up traditional doctrine and eventually the bureaucracy won and cut their nose of to spite their face. Yet the stories of the men are stuff of legend and a very unknown unit now is able to be studied from a person who had been there, done that. I highly recommend this book to any person who is interested in Special Operations, whether it be in Africa or Afghanistan. 6 stars . Dan Tharp author of Africa Lost: Rhodesia’s COIN Killing Machine, Task Force Intrepid: The Gold of Katanga- Bravo! Publishing with St. Martin’s Press under SOFREP.com’s banner, I will release a survey of Rhodesia’s Special Forces and shed some light on a long fogotten subject in Military History. Much more to come in 2013 and 2014!! !